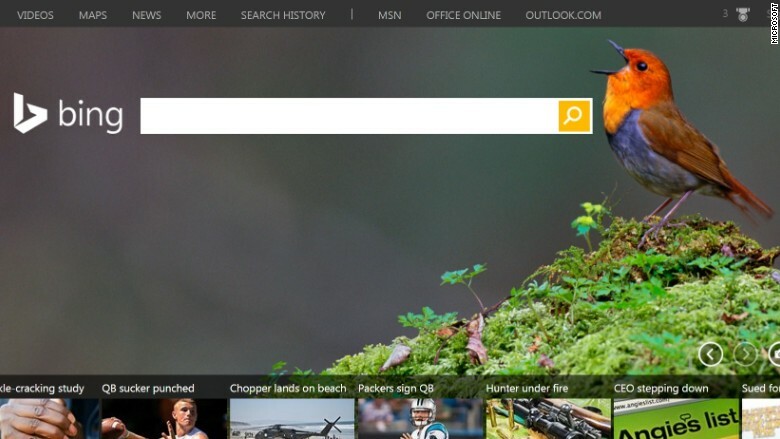 Microsoft's Bing has become more popular and added $1 billion to revenue this year. Microsoft Bing has emerged as the true underdog of search engines. Chief Financial Officer Amy Hood said Thursday that Bing had finally achieved profitability in its first fiscal quarter of 2016, and that the search engine contributed more than $1 billion to Microsoft's revenue for this quarter. The last time Microsoft broke down the numbers on Bing, back in 2011, it was bleeding a billion dollars a quarter. And it has remained unprofitable over the last four years. People were perplexed as to why Microsoft (MSFT) kept pouring money into a seemingly dead investment. However, the tech giant now has results to show: Microsoft's search revenue, excluding traffic-acquisition costs, grew 29%. Much of Bing's success can be attributed to its subtle presence. Not many people may actively log on to Bing, but it's everywhere. Obviously, Microsoft products push Bing -- Internet Edge and Cortana, the virtual assistant on Windows phones, search through Bing. Plus, Windows 10 was more positively received than it's predecessors, which has helped boost Bing's success. About 51% of Yahoo (YAHO) searches are powered by Bing. In the last couple of years, Apple (AAPL) bid adieu to Google (GOOG) and now the tech giant uses Bing for Siri and the spotlight function on Macbooks as well. Market share is key in search: With it, advertisers flock to you, and you can charge high rates for ads. But without it, search is a very expensive business. Bing crossed the 20% market share threshold in search for the first time in March, and currently holds 20.7% of the desktop search engine market share, according to comScore's September 2015 data. Although it trails far behind Google at 63.9%, it trumps Yahoo, the third-best search engine, by 8.1%. Microsoft posted revenue of $20.4 billion overall for the quarter, down 12% from the same quarter a year ago.